Adding details, using a reference photo made all the difference. Originally I was going for a simpler look, but it was falling flat. I really like using acrylic gel medium to thin out the paint and overlay colors, like for the clouds. I also used an art sponge, to make the shadows in the crashing wave look more natural. Categories: Acrylic, Acrylic seascapes | Tags: acrylic painting, painting the ocean, Painting waves, Seascape | Permalink. I often start and work on more than one painting at a time. It’s nice to have another painting to grab when you’ve reached the point with a painting where the newest layer needs to dry. Sometimes I work on more than one painting from the same reference photo. I’m not trying to create duplicate paintings. I’m giving myself the opportunity to try different things, to learn, to explore. The paintings above are from the same photo. In one there is a seagull. The crashing part of the wave is slightly different. Even the color of the sky, the detail of the sand. For me it’s not about which one is better. It’s more about what I learned during the painting process. See my collection of seascape paintings at shop.eileenmckenna.com. Prints are available on watercolor paper or canvas, in many sizes. 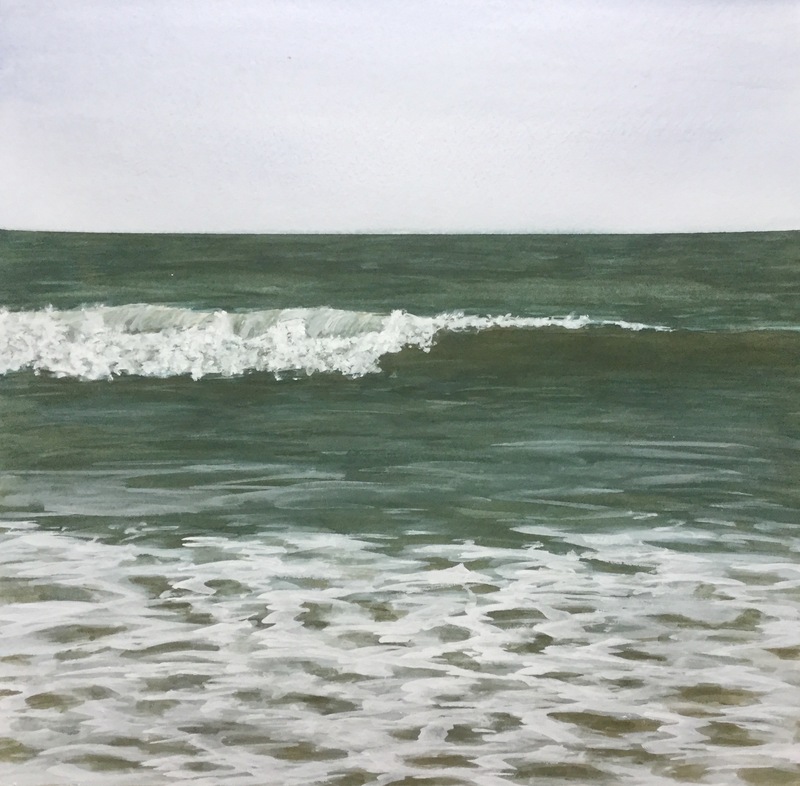 Categories: painting the beach, Watercolor | Tags: Painting subjects, painting the ocean, Painting waves, Reference photos, Watercolor | Permalink. It felt good the other morning to sit and paint. I didn’t have any ongoing paintings, so first I set up several boards – taping the watercolor paper down. For this painting I worked with the paper still stuck to the pad – not as effective as taping it down, but I ran out of boards. I started 4 paintings in one sitting, using two reference photos. The goal of painting two from the same photo was to do one version that was a quicker less detailed version. Although I can’t say this will actually happen this time around. It’s always easier for me to sit and paint when I have a painting in progress, especially if I don’t let too much time pass between working on it. And since you need to allow time for the layers to dry, I like having at least two paintings to work on at once. When I came home later in the day, the paintings were on my mind, so I picked one to work on some more. I ended up focusing solely on this one and finished it by the end of the day. Second layer. I needed to darken things up a bit. Third layer. Still tweaking the color of the ocean. Started added the foam. Fourth layer – more foam. After this I added more color to the sky. 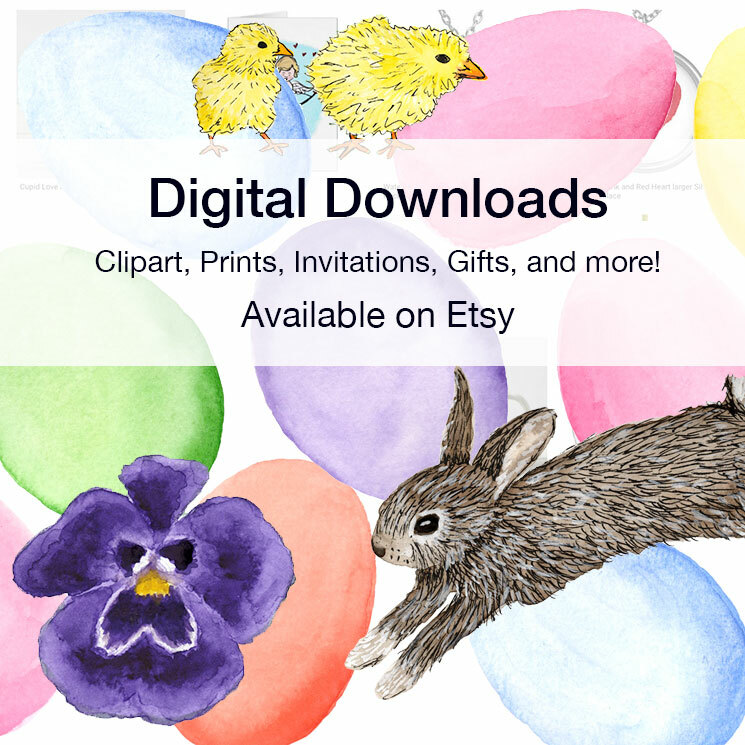 Prints of my watercolors are available at shop.eileenmckenna.com. Come visit! Categories: painting the beach, Watercolor | Tags: Beach art, Painting seascapes, Painting waves, Seascapes, watercolor | Permalink. Stop, don’t ruin it! There is always the next painting. Last week I was finishing up a painting and kept noticing what I’ll call weaknesses – areas I wanted to better capture. In an effort to improve the painting I kept tweaking it. In the end I overworked it and should have left it the way it was. I’m learning that as you paint, especially the same subject, you find new areas that you want to improve on. 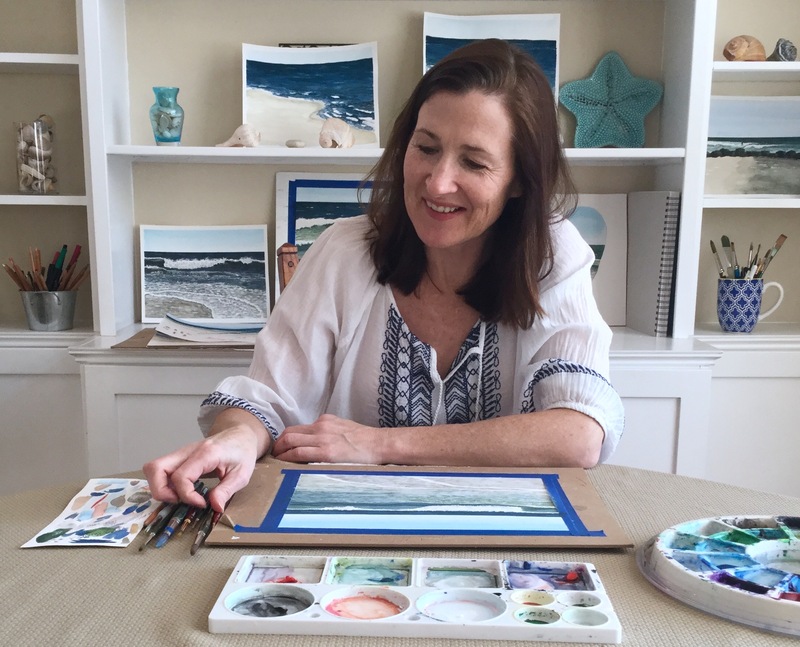 At first, when I started focusing on painting the ocean, my goal was to capture the water – the waves, the shadows, the movement. As I got better at that, I focused on making the foam look more realistic. Then it was adding more interest to the sky. Not just painting a blue sky, but clouds, and light from one direction. I even did two paintings that the clouds are almost the focal point. Now my goal is to capture the way the light hits the water. This sliding scale means that with each painting I may achieve a previous goal, but a new one is likely to reveal itself. With the last painting I should have quit while I was ahead. With this painting, I stopped myself. I did accomplish more than the last, and there is always the next painting. 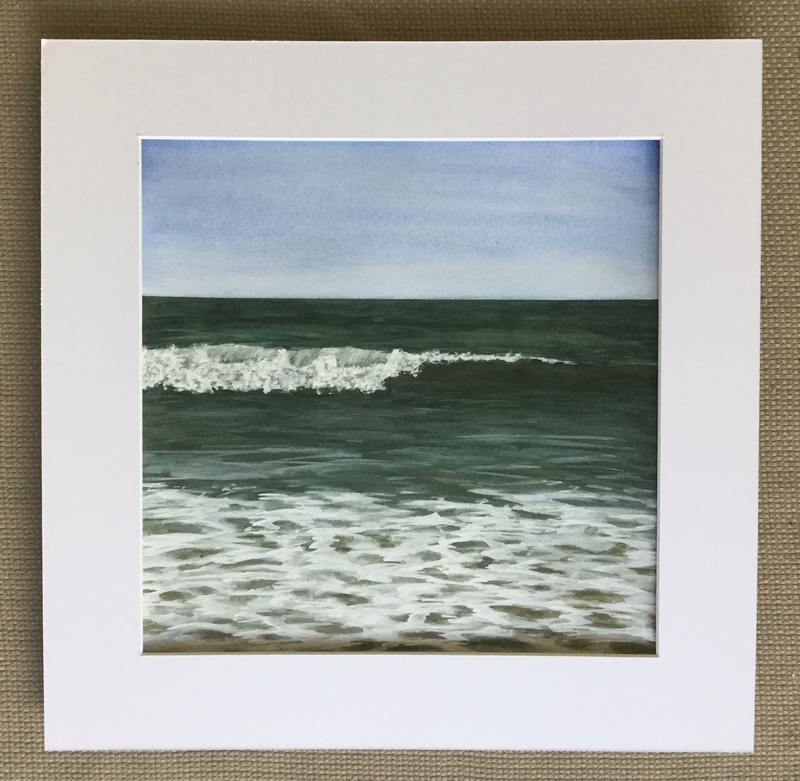 I’ve added three new watercolor ocean paintings to my shop! Prints are available at shop.eileenmckenna.com. Take a look! Categories: Gouache, painting the beach, Watercolor | Tags: Don't overwork a painting, Painting waves, watercolor, When a painting is done, World Watercolor Group, worldwatercolorgroup | Permalink. Surf Camp is the third collection of watercolor paintings I’ve released as Limited Edition Giclee Art Prints in my online shop. While my previous paintings featured bright blue skies, for these two paintings I had the pleasure of painting dark cloudy skies. 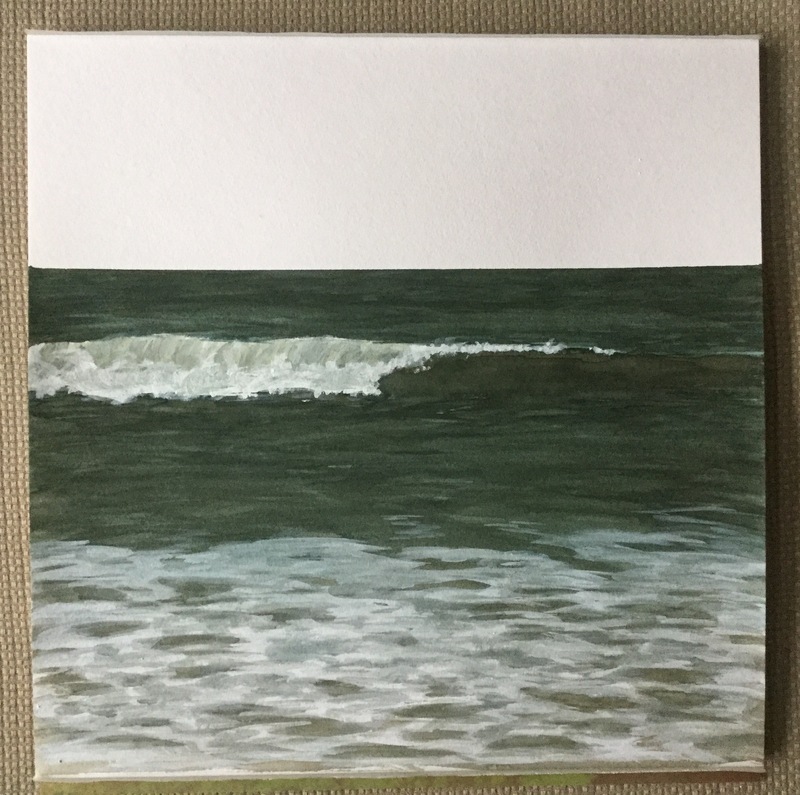 Categories: Online Shop, painting the beach, Uncategorized, Watercolor | Tags: beach, Beach art, ocean, Painting clouds, Painting waves, surf, surf camp, Surfing, watercolor paintings, Waves | Permalink. Painting for an entire hour proved impossible this morning, as I had things to do. But a half hour is better than nothing. As I worked, I thought about how daily work keeps you “in” a painting. You’re engaged in the project, even thinking about it when you are away from it. Being “in” a painting helps bring you back to your creativity. It’s easier to get to work – you know what to work on, perhaps you’ve even thought out how to tackle an area of the painting. But when a few days pass without revisiting your painting or project, that thread is broken. It’s harder to motivate to sit down and create, because you might not remember where you left off or possibly even what you were working on. Want a dose of creative inspiration? Sign up for my newsletter “My Creative Collection” by clicking here. Learn more about the newsletter here. Prints of my watercolor beach paintings are now for sale at shop.eileenmckenna.com. Take a peek! Categories: creative habits, Watercolor | Tags: daily creative habits, Painting waves, watercolor, Watercolor | Permalink. The second day my son participated in surf camp was a cloudy day. When I saw my pictures I decided to try to paint the clouds, as many of my ocean paintings have clear blue skies. 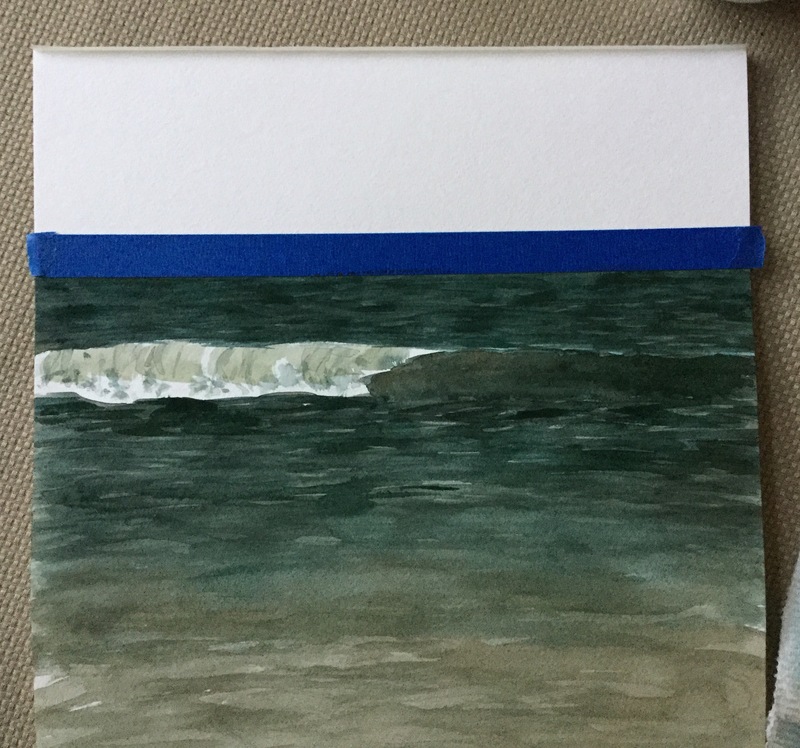 As much as I have developed a process for painting the ocean, with each painting I still have to figure things out – mixing the right colors and shades, capturing the details of the waves. It’s still a challenge, but a rewarding one! Categories: painting the beach, Watercolor | Tags: Ocean painting, Painting clouds, painting the ocean, Painting waves | Permalink. The goal of this painting was to capture the details of the wave as it crashes – the shadows inside the foam, the spray, the movement. Categories: painting the beach, Watercolor | Tags: Ocean landscape, painting the beach, Painting waves, watercolor, World Watercolor Month | Permalink. 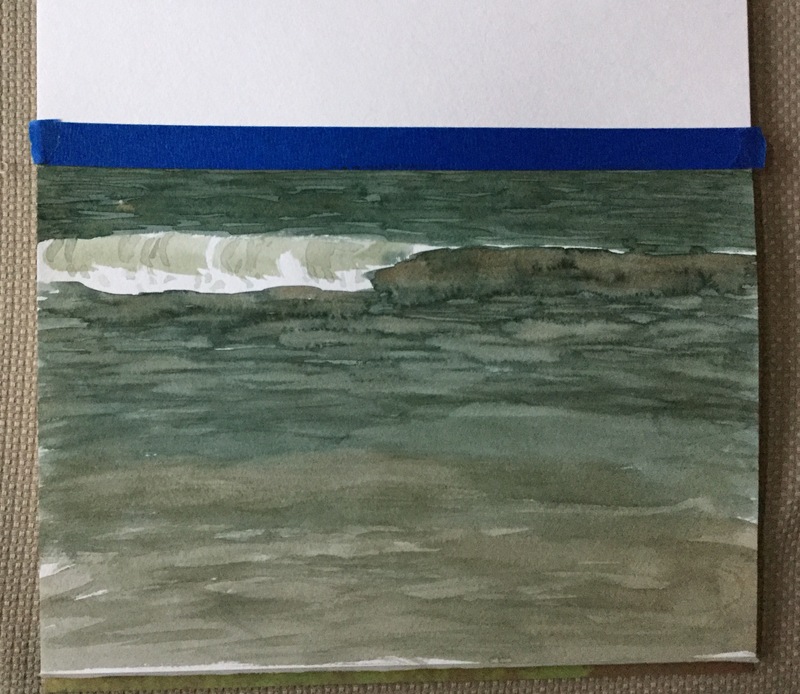 I’ve aspired to capture the ocean in watercolor for years. In December I made “painting the beach” my New Year’s project. The snow was falling outside, but I was inside painting waves. With each painting I learned and improved. Some of my firsts in early January. I tried new tools and supplies and incorporated them into my process. I’ve kept with it and over six months later I still often paint the ocean. In some ways I feel like I’ve found my thing. Yesterday I was standing in the ocean, watching the waves break, watching the foam churned up by the waves wash in and out. It was surreal, like standing in a painting and all I could think about was white gouache. Categories: painting the beach, Watercolor | Tags: beach, beach painting, ocean, Ocean painting, painting, painting the beach, Painting waves, Techniques, tips, watercolor, Waves | Permalink. I added some darks to the rocks and a bird and now I’m considering this one done! Feels particularly good considering this one almost was completely abandoned. Categories: painting the beach, Watercolor | Tags: beach painting, Jetty, painting the ocean, Painting waves, watercolor, Waves | Permalink.